Deer hunting season is upon us, so it’s time for emergency departments to start seeing an increase in hunting injuries. Although you would think this would mean accidental gunshot wounds, that is not the case. The most common hunting injury in deer season is a fall from a tree stand. 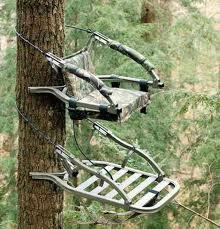 Tree stands typically allow a hunter to perch 10 to 30 feet above the ground and wait for game to wander by. They are more frequently used in the South and Midwest, usually for deer hunting. A recent descriptive study by the Ohio State University Medical Center looked at hunting related injury patterns at two trauma centers. Half of the patients with hunting-related injuries fell, and 92% of these were tree stand falls. 29% were gunshots. The authors found only 3% were related to alcohol, although this seem very low compared to our experience in Minnesota. 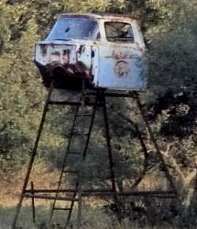 Most newer commercial tree stands are equipped with a safety harness. The problem is that many hunters do not use it. And don’t look for comparative statistics anytime soon. There are no national reporting standards. The image on the left is a commercial tree stand. The image on the right is a do-it-yourself tree stand (not recommended). Remember: gravity always wins!